How would you convince seven shipwrecked individuals on a deserted island to buy your book? If you were asked to give a speech on the Book Walk of Fame what would you thank and why? 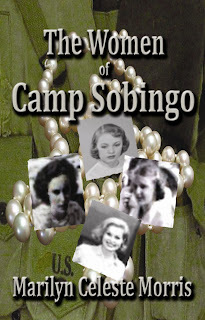 Find out all this and more today when The Real Hollywood’s Book chat welcomes author Marilyn Morris, author of the novel The Women of Camp Sobingo. ABOUT THE BOOK:Four women of diverse backgrounds form a bond while en route to join their Army officer husbands in Korea in 1946. Their experiences in a far-flung military compound strengthen three of the women, but a fourth chooses to end her life, and during a reunion twenty-five years later, long-held dark secrets and sorrows are revealed. Welcome Marilyn, it’s a pleasure to have you visiting today. Let’s get started with the trivia interview and test your knowledge of television and movies. 1. Gilligan’s Island Trivia – Taking a three-hour boat tour, you find yourself shipwrecked on this tiny little remote island where 7 people were also shipwrecked. How would you convince this varied audience to read your book? Remember on this island besides The Skipper, his little buddy Gilligan and MaryAnn, is the smart Professor, the rich Mr.& Mrs. Howell who have the money to make your book into a movie and Ginger the movie star who might have a starring role. Please talk to the audience not to me. Marilyn: “Good evening, fellow castaways! For your entertainment, I have copies of a great new book that just came out. Something for everyone, I promise you. Let me tell you briefly: The year is 1945. WWII is over. Instead of ships heading home from the war, some are actually headed to the Far East and Europe. These ships are carrying not soldiers and sailors, but dependents: women and children. They are going to join their husbands and fathers in the US Occupation forces. We look in on four of these women, army wives, who are from different backgrounds, but who form bonds of friendship that will sustain them throughout their lives in an isolated military compound outside of Seoul, Korea, known as Camp Sobingo. We follow the backgrounds of Trudy Cavanaugh, who has married the heir to the Cavanaugh publishing empire, but she relishes her freedom and independence from the domineering family; Maggie Gorski, the brassy Chicago-born mother of two unruly boys, who loves beer, bridge, her husband and her kids, and not necessarily in that order; Nell Martin, a West Texas farm girl whose quiet inner strength and resourcefulness cheers her bridge partners through long winter nights; and Leah Damon, the quiet, insecure model who turns to drink and other men to stave off her personal demons. One of these women, however, chooses to end her life there. Her death haunts the others in their close-knit community, especially Trudy Cavanaugh. Twenty-five years later, at a reunion at the Cavanaugh estate, secrets and sorrows are at last revealed and ghosts are put to rest. “Ginger, you would be perfect for the role of Leah Damon! And Mary Ann, you could be Nell Martin! Little Buddy, there’s a part for you, too! You are perfect for the role of Stretch, one of the “Three Dwarves” of Doc, Stretch and French, who enliven parties and other dull moments in the compound. Marilyn: Oh, Trudy Cavanaugh, by all means. She’s what every girl dreams of. Coming from humble beginnings, she marries her college sweetheart, who just happens to be the heir to a fabulous publishing empire, which she inherits from her father-in-law instead of her husband. Old Colin Cavanaugh knows quality when he sees it. She takes charge of the empire and turns the publishing world upside down. 3. Gone With the Wind – If Rhett Butler were to change his famous line from “Frankly, My Dear I don’t give a damn” to Frankly, My Dear I think you should read this paragraph from this bestselling novelist. What paragraph is Rhett referring to? Tell us how it fits into the novel? Marilyn: Rhett is impressed by the presentation of Katherine Cavanaugh, the grand dame of the Cavanaugh clan, wife of the powerful publisher Colin Cavanaugh and mother of Philip, who has recently married his college sweetheart and has come home to introduce Trudy to the family. Katherine would have fit in nicely at Tara and quite possibly, no Yankees would have ventured near the plantation~! Her brief period of relaxation was interrupted by the sound of high heels tripping rapidly along the parquet floor of the main hallway. “That would be Mother,” Philip said, tossing Trudy an encouraging wink. He stood as Katherine entered the room. Philip had described his mother well. Katherine was petite, almost fragile-looking, yet she carried herself with such regal bearing that she gave the impression of being taller. She was wearing a deep green suit of raw silk, with a string of pearls around her slender neck. Her brown hair, which was pulled in a chignon at the nape of her neck, was attractively streaked with gray. “At last you’ve come to see us, Philip. I don’t know why my son can’t come home more often.” She allowed him to peck her cheek. Katherine turned her ice-blue eyes on her new daughter-in-law. “How do you do?” Trudy extended her hand. 4. Hollywood Book Walk of Fame – A bookstore in Hollywood, California had decided that books should have their own walk of fame. So they have lined the sidewalk in front of their store with book molds in the sidewalk. Your name is to appear on one of these book molds. You give an acceptance speech at the ceremony. What would you say and who would you thank? Marilyn: I want to thank every woman who was, is, or will become, a military wife. It’s not only the men who sacrifice in the service to their country, but their wives and children. My mother was one of those wives…. My mom was a WWII Vintage, hauling kids from one end of the earth to the other, birthing children overseas, in dusty, remote duty stations, jungles and frozen tundra. Enduring seasickness, inoculations for God knows how many exotic diseases, keeping our shot records, school records, silk kimonos, pets, bicycles, treasured toys (despite household goods weight restrictions - some of her stuff had to be left behind; it wasn't nearly as important as her kids' stuff). Taking us, unescorted, into the foreign countryside, determined we absorb the foreign culture as fully as we could; enforcing "the rules" in Dad's frequent absences, with almost as firm a hand as his, but seasoned with just a pinch of understanding what we were going through. Ordering from the Sears, Roebuck catalog and sweating the exquisite timing for a special outfit for an important occasion, such as graduation from 6th grade, being chosen May Queen, or playing the part of the Princess in the school play, and when the parcel didn't arrive in time, sacrificing one of her very own "ball gowns." A West Texas farm girl training a houseboy and house girl in the Orient one year, in Pidgin English, no less; doing her own housecleaning and laundry the next, and handling both with amazing aplomb. The next year, she begins all over again, training in garbled German-Austrian dialect with voluminous hand gestures, a giant woman refugee from Yugoslavia as maid, cook and baby sitter, in quarters appropriated from Nazi sympathizers, while keeping in mind that packed suitcases under the beds and Russians across the Danube meant evacuation could be implemented at any moment. Keeping her own grief in check while her kids cry over leaving yet another batch of friends, knowing she might never see her own circle of friends again. Packing, unpacking, making a home with "make do, and do without.” Keeping in touch with family back in the Zone of the Interior by letter, written at times by dim lantern light when the Russians in their Zone of Occupation decided to deprive us of electricity at any given time. Myriads more sacrifices made on our behalf. Ordinary women in extraordinary circumstances. God bless her, and all the Military Wives, past, present and future. . Thank you, Marilyn, for stopping by The Real Hollywood blog today. I wish you continued success on your virtual book tour and who knows your book might just make it to the silver screen. This book (I think if not a theme much like it) was a huge huge BBC series hit back in the 80/90's Hmm thinking back that might have been Japan and the Burma, but the characters sound very much the same. It was the BGT of that year with millions waiting for each episode. Thank you so much for sharing it has bought many memories flooding back. Where have you been hiding lately Marilyn? It's good to see you out and about in the virtual world. Geeze, Barry. I must have missed it-- and I'm a big fan of the BBC. Can you tell me more about it? And what's BGT? Thank you to all those who left comments for our special guest author Marilyn.